Last major update issued on May 8, 2016 at 05:15 UT. 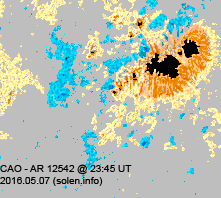 The geomagnetic field was quiet to active on May 7 under the influence of effects from CH732. Solar wind speed at SOHO ranged between 397 and 591 km/s. A moderately strong disturbance associated with CH733 arrived just after midnight on May 8. 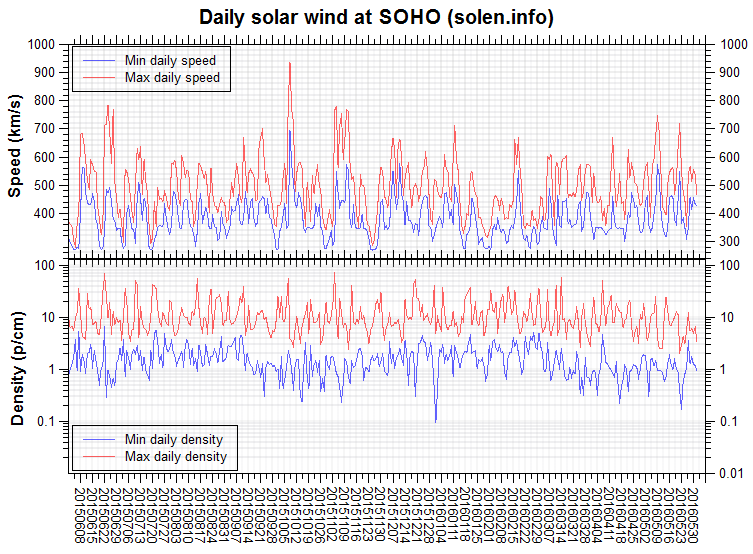 Solar flux at 20h UTC on 2.8 GHz was 88.0 (decreasing 22.6 over the last solar rotation). 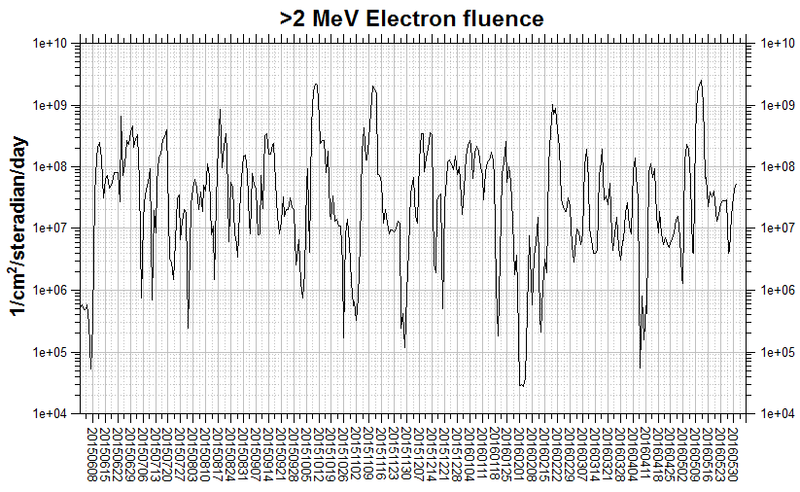 The 90 day 10.7 flux at 1 AU was 93.6. The Potsdam WDC planetary A index was 9 (STAR Ap - based on the mean of three hour interval ap indices: 8.8). Three hour interval K indices: 41122213 (planetary), 32222323 (Boulder). 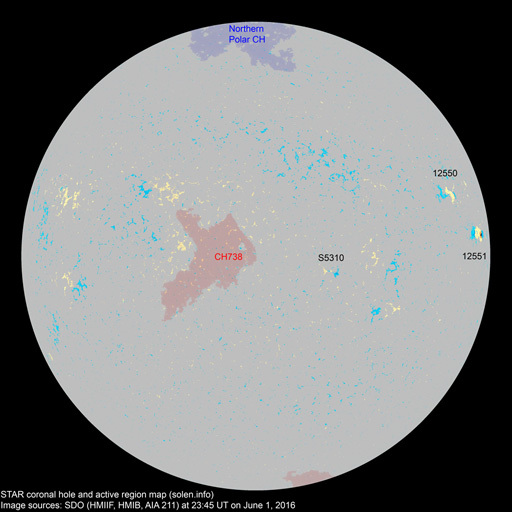 At the time of counting spots (see image time), spots were observed in 4 active regions using 2K resolution (SN: 69) and 3 active regions using 1K resolution (SN: 47) SDO images on the visible solar disk. Region 12539 [N18W54] decayed and could soon become spotless. Region 12541 [N04E02] decayed slowly and produced the single C class flare of the day (apparently triggered by the filament eruption mentioned below). Region 12542 [N11E29] was mostly unchanged and quiet. New region S5271 [S06E27] emerged with a few spots. A filament eruption was observed beginning in the northeast quadrant at 14:42 UT in SDO/AIA imagery. 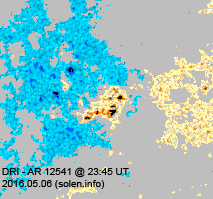 The location was to the north and northwest of AR 12542. LASCO imagery after this event is unavailable, however, the extent and the location of the event makes it possible that a component of any CME produced may be Earth directed. May 5-7: No obviously Earth directed CMEs were observed in available LASCO imagery. A filament eruption on May 7 my have produced a partially Earth directed CME, however, no LASCO data for the hours after this event is currently available. 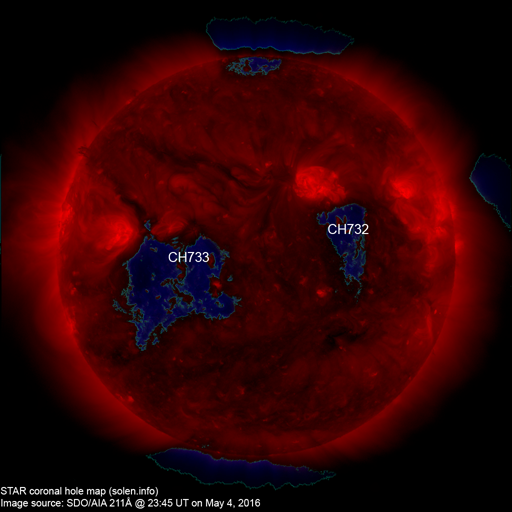 A trans equatorial coronal hole (CH733) was Earth facing on May 5-7. 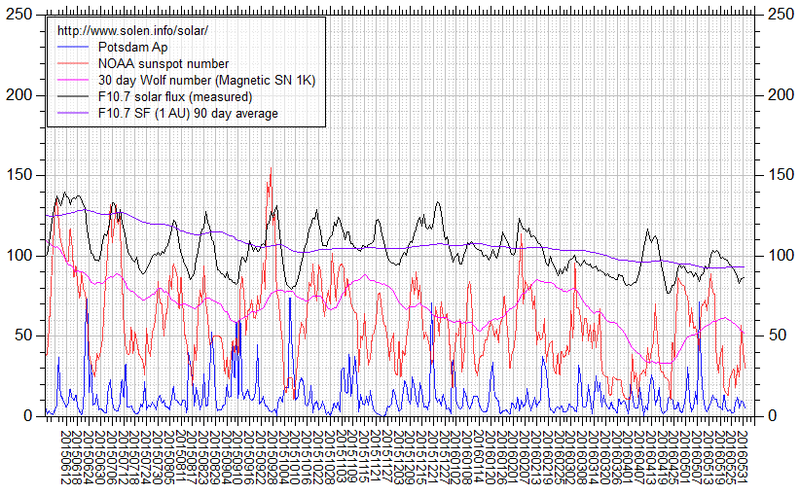 The geomagnetic field is expected to be unsettled to major storm on May 8 due to effects from CH733. Quiet to active conditions are likely on May 9-10.